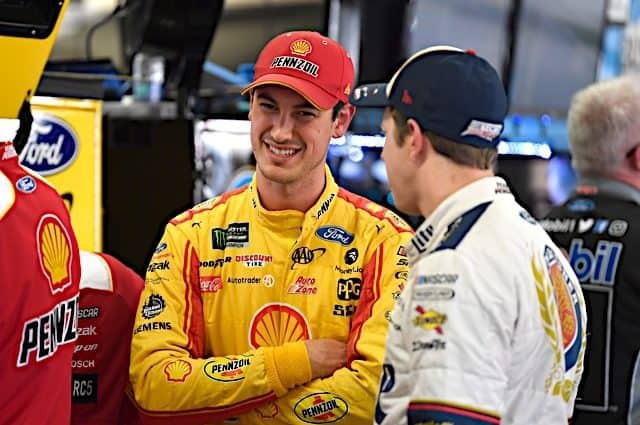 *Rookies in the Starting Lineup:* _(Starting order set by owner points due to rain)_ Regan Smith (31st), Michael McDowell (33rd), Sam Hornish, Jr. (35th), Dario Franchitti (41st), Patrick Carpentier (43rd) *Unofficial Finishing Positions:* Sam Hornish, Jr. (22nd), Patrick Carpentier (24th), Regan Smith (32nd), Michael McDowell (37th), Dario Franchitti (43rd) *Rookie of the Race: Sam Hornish, Jr.* It didn’t take long for the Defiance, Ohio native to make his presence known at the venue he considers his home track on the NASCAR circuit. By the race’s one-quarter mark, Hornish, Jr. was running consistently in the Top 20 after starting well back in the pack. 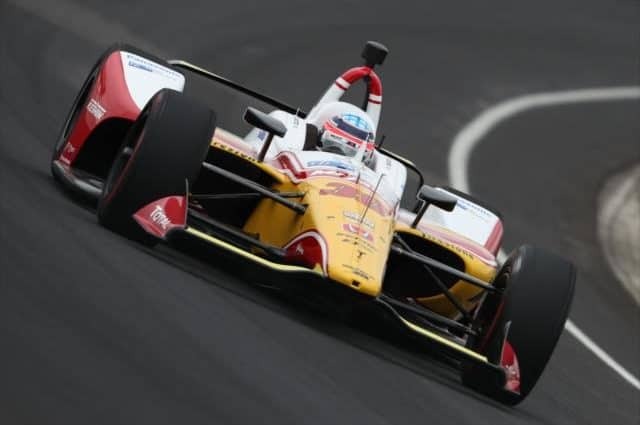 But as it turns out, the Mobil One team would be the strongest performer out of the Roger Penske stable, running in or near the Top 15 for Michigan's middle segment while his teammates floundered with poor handling cars and engine issues. However, things would get even more interesting for Hornish as the race entered its final stages. Rain on Friday afternoon washed out NASCAR qualifying at Michigan International Raceway, meaning the starting grid was set by owner points -- leaving the No. 70 Haas Automation Chevrolet and the No. 34 Front Row Motorsports Chevy as the odd teams out. But while the teams on the bubble breathed a sigh of relief, their calm was short-lived, as they now had to deal with starting the race in the back of the field in a car that has been highly criticized for not running well in traffic. So, which teams towards the back of the field were able to navigate their way to the front? See for yourself as we break down the hunt for the Top 35 in this week's Bubble Breakdown for the Lifelock 400 at Michigan International Raceway. It had to happen, really. Petty Enterprises’ announcement on Wednesday that they had sold a portion of the family business that has been around as long as NASCAR has been on the track was not really a surprise. But on some level, it is a disappointment. Boston Ventures, by all accounts, is a wealthy, stable company with pockets deep enough to fund new technology for the two-car team-and are even talking already of adding a third team to the stable. That part is help sorely needed. Petty Enterprises was a team that time had nearly passed by. A Contender a decade ago, the team was being left behind by technology--and its growing cost. The money that Boston Ventures appears eager to put into the team will be a welcome and necessary addition. It will take time, but if approached correctly, the team may return to a semblance of its former glory. Then why does it seem like the end of an era? We’ve really had some good finishes in both series the last few weeks and I’m excited to be a part of Michael Waltrip Racing. We brought home a top 10 at Lowe’s Motor Speedway, which was a career best for me at the Sprint Cup level. A 10th place finish for that event, which is a very tough race, proves the capabilities of this race team. We just need to start doing that on a more consistent basis and soon we’ll be in the situation where we’ll be finishing in the top five. Nashville is one of my favorite race tracks that we run on in the Nationwide Series and we almost brought home a victory last Saturday night. I really didn’t want to see that caution there at the end. Once the No. 2 car got under us, there was nothing more I could do. Still, I was really proud of the guys on the Aaron’s Dream Machine team, they put us in position to win and that’s all I can ask of them. *Q: Hey Matt. I’m writing about another Matt, Matt Kenseth, who looks to have found the groove! He did the same thing in 2005 and made the Chase. They have momentum on their side. Is this a team of destiny or what!? Thanks! * _— Trace Stewart_ *A:* Team of destiny? Maybe, but we’re getting ahead of ourselves here, and chemistry is such a fickle thing. 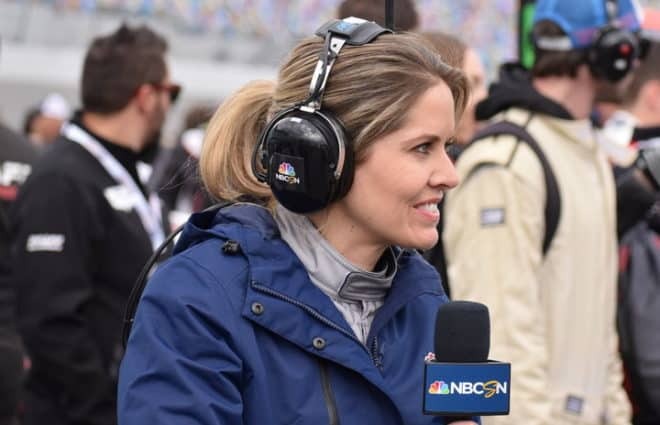 I talked to a crew chief before the season, and he expected a seamless transition atop the pit box from Robbie Reiser to Chip Bolin: "They’re the cornerstone of the Roush Fenway organization right now," he told me. "I don’t think the crew chief change is going to hurt. They’ve been talking about it for a couple years. It still takes some time to fully adapt, but there’ll be plenty of motivation for them to step it up." Sunday's 500-mile race in the heat at Pocono was apparently a long, tiresome day for drivers on the Cup circuit. Following the event, Dale Earnhardt, Jr. was interviewed by the hosts of the Victory Lane show on SPEED, where his exhaustion led to outward frustration: he stated that the car needs to be fixed and the race needs to be shortened, period. Jeff Gordon also was quoted as saying that the day was very long, claiming NASCAR should consider tightening up the race from its traditional 200 laps. Even race winner Kasey Kahne was able to sneak a jab in; the young driver said this was the first time he'd run the race where he didn't feel like it was a long day. Well hey fellas, you know what? I've got news for you; there are thousands of race car drivers around the country who'd love to be in your seat. If you can't handle it, get out and let them take a shot! Michigan is a wide open two-mile track that offers drivers plenty of options and room to make moves which, hopefully, will lead to on-track passes and its fair share of racing action. But for fantasy players that worry about their drivers being caught up in someone else’s problems, they can rest assured that it generally will not happen at Michigan. You have all of the racing room of a multi-groove track to thank for it; but on a serious note, driver history at a place like Michigan will frequently dictate future success, thanks to the multiple racing grooves offered by the wide open surface. The cream will rise to the top at this speedway; and hopefully, your fantasy team will rise right along with it. So, will Michigan be a repeat of recent years, or will someone who has achieved recent success surprise and steal a win? Will Dale Earnhardt, Jr. finally break his losing streak, and what driver should you avoid at all costs? Only this week’s Picks ‘N’ Pans will tell ... read below to find out. The tricky triangle in Pennsylvania had several twists and turns for the Cup drivers this past weekend. Who left the track climbing up the Pocono mountains? Kasey Kahne, for one; he's making believers out of our staff with his second win in three starts, and even secured a first place vote again this week. And while Matt Kenseth isn’t in the Top 12 in driver points, he remains within the Top 12 of our poll. But how about who's sliding down the mountain? Kyle Busch's spin and subsequent last place finish certainly took a few votes away ... but was it enough to knock him out of the top spot? And what RCR driver's recent on track travails have caused him to drop completely out of our Top 15? Read on to find out in the latest edition of our Power Rankings, and see if you agree or disagree with the choices of your favorite Frontstretch writers. Last season, two-time Sprint Cup Champion Tony Stewart predicted that Dale Earnhardt, Inc. would become "a museum" without their star driver, Dale Earnhardt, Jr. As we approach one year after Junior's official announcement he'd signed with Hendrick Motorsports, it's a prophecy that looks like it may be coming to fruition. 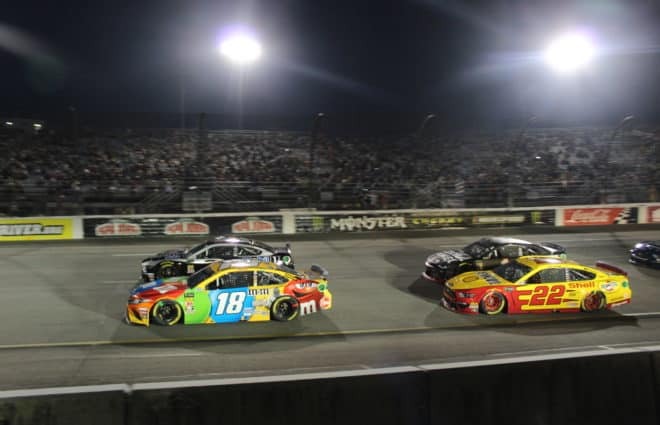 A look at the driver standings would certainly, at least at first glance, confirm that DEI drivers Paul Menard, Regan Smith, and Martin Truex, Jr. are not among the elite of NASCAR’s Sprint Cup Series. Far from it; of the three, only Truex, Jr. -- currently 16th in points -- is even within the Top 20 in the rankings. In fact, Menard at 27th and Smith at 31st are achieving genuine "also ran" status in their equipment as of late, with Smith's team even rumored to shut down due to lack of financial support. As for Truex, Jr. -- the organization's lone Chase qualifier from 2007 -- he has seen the No. 1 team's performances languish to this point, remaining winless through 14 races this season to date. More than anything else, his struggles might be the best argument that DEI is on a downward spiral to non-competitiveness. But there's one piece to this puzzle that just doesn't fit.